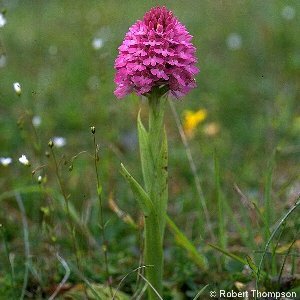 Pyramidal Orchid (Anacamptis pyramidalis) is so-called because of the obvious rounded-pyramid shape to the flowering spike, especially when young (but some other orchids like Dactylorhiza fuchsii also show this shape when young). 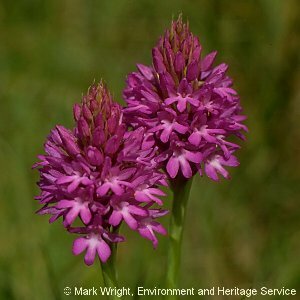 The colour of the flowers is a beautiful deep pink; they are visited by moths and butterflies which feed on the nectar at the base of the long slender spur. 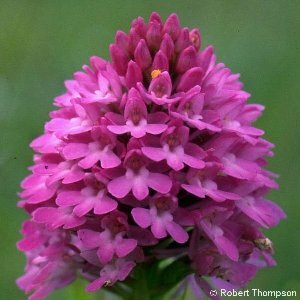 All names: Anacamptis pyramidalis (L.) Rich.